At NewBridge School we follow the California Common Core Standards, using state approved materials and textbooks. Our teachers incorporate academic themes related to the Common Core across curricular settings and focus on quality not quantity of subject matter. Curriculum includes the core subjects of reading, language arts, mathematics, science, social studies, and PE. Course content is taught in a structured, multisensory approach that moves from the concrete to the more abstract. Orton-Gillingham methodologies are interwoven throughout our program. Another distinctive feature of the Orton-Gillingham Approach is that reading, spelling and written language are taught simultaneously. It is not only a reading approach. 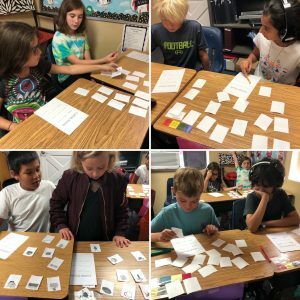 Orton-Gillingham is structured, meaning that the structure of the language is taught and that each lesson is carefully crafted using the same lesson segments each time and the same processes in teaching the student to the point of automaticity. Orton-Gillingham is sequential, meaning that the language is taught from the simple to the more challenging; from the concrete to the abstract; from short, regular forms to longer and irregular forms. Orton-Gillingham directly teaches phonics – the alphabetic symbol-to-sound and sound-to-symbol relationships. Orton-Gillingham teaches the logic of the language; it is 85% regular for reading and spelling when one knows the rules and patterns. Only 15% of the language is irregular or non-phonetic. These words must be memorized for both reading and spelling in a logical sequence, using an appropriate multi-sensory process. The Orton-Gillingham Approach has withstood the test of time, having been successfully used with thousands of dyslexic students for more than 70 years. In recent years this multi-sensory structured language approach has been independently validated by modern research using Positron Emission Tomography (PET scans) and functional Magnetic Resonance Imaging (MRI), as well as studies by the National Institutes of Health at Haskins Laboratory at Yale University and at 17 other universities.